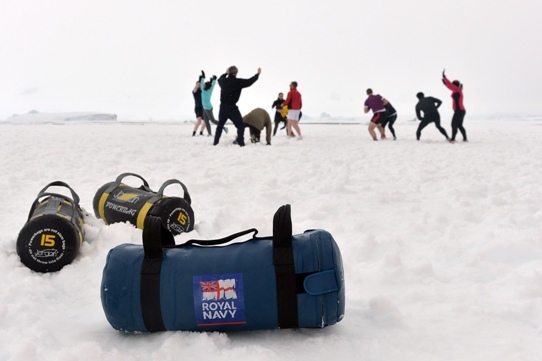 Sailors on the Royal Navy's ice patrol ship have made use of a rare lull in her busy programme for a unique workout session on the ice in Antarctica. More than a dozen of HMS Protector's crew, led by the ship's physical training instructor, seized an hour-long opportunity to perform squat thrusts, press-ups and other moves on sheet of thick ice. Protector has been based at Portsmouth but will move to Devonport in Plymouth when she returns to the UK in 2015. The icebreaker is coming to the end of the 2013-14 'summer season' surveying the waters around Antarctica - the first of two Austral summers she'll spend off the frozen continent before returning to the warmer waters of the UK. 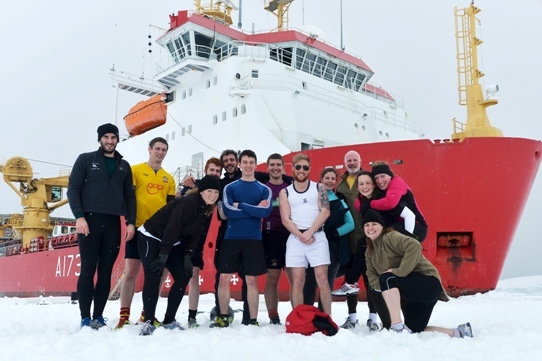 As well as posing challenges to the bridge team, safely guiding the ice patrol ship around as she surveys remote waters and supports scientific research, the weather conditions also upset Leading Physical Trainer Gareth Smith's normal fitness regime. On most Royal Navy ships, the upper deck is a physical training instructor's playground - using it for circuits, while the flight deck is ideal for workouts when not needed by the helicopter. In the southern ocean, however, HMS Protector's upper deck is out of bounds beyond the Falklands because it's too cold. The ship's lower hold is an alternative venue for Gareth's workouts - but space is limited, as is the session the PTI can organise, and the air is far from fresh. But on Protector's third work period amid the ice this Austral summer, with an hour or so free in the ship's working programme, the trainer seized the opportunity to arrange a workout session on the ice. "On the rare occasions we have been able to get people on the ice, the ship's company has done everything from playing football to having Christmas dinner - trimmings and all," Gareth explained. "On this occasion, the ship was surrounded by ice for miles around and the decision was taken to allow people on to the ice. "All those who wanted to had managed to get down, stretch their legs and generally frolic on the ice. "The idea then struck me: after a month of being crammed in the ship's lower hold, if we'd played football, what prevented me from taking a circuit? A chilly one, granted, but one in unbelievably pure air, with an amazing backdrop and without the constraints of space." Fifteen minutes later, Gareth was in his kit and a dozen shipmates had joined him on the ice - deemed strong enough to take the weight of 15 souls. 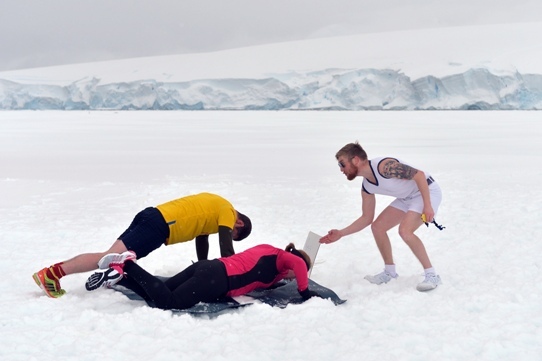 "Once people got in motion and were in full swing of their exercises then the only real adverse effect of the cold was the icy chill of the Antarctic air in your lungs when inhaling deep breaths after completing yet another burpee [squat thrust] - that and the constant danger of someone getting distracted from press-ups and lobbing a sizeable snow ball," Gareth added. After the fun on the ice Gareth was in the unique position in the Royal Navy of being able to lead all his circuit-goers down to Protector's sauna (the ship was built for the merchant navy before being bought by the RN, hence the luxury) for a 'warm down' and the chance to stretch aching muscles.